Hey, look, it's Not YuGiOh! This show feels like it combines the character designs - well, the Dollar Store knock-off versions of the character designs - from the original YuGiOh, with the general setting of GX and a card game that feels like EDH Magic the Gathering and Duel Monsters had a baby, then lobotomized it. And that's really the issue here: the card game at the heart of DDD just doesn't have enough meat to it for the games themselves to be interesting. Where YuGiOh continually invented contrived nonsense to make its games more dramatic, this game sticks to a fairly faithful adaptation of its rules, wherein the game frequently ends after a player takes his third turn. The players just huck cards at one another, with the rules making Turn 0 wins perfectly easy to conceive of. The MO of every player boils down to 'blitz and win through overwhelming force,' with the closest thing to a deviation being the third opponent, who has a gimmick for how he buffs his monsters to apply said overwhelming force. 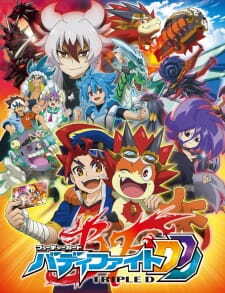 Episode structure is conveniently divided into two halves, with the first half being character interactions and the second half being a card battle. The only characters of note are the protagonists, Gao and Bal. Bal behaves as Gao's kid brother, if said kid brother also happened to be a baby dragon, and winds up right on the line between endearing and obnoxious. Gao is only really a character insofar as how he plays off of Bal, to the point where he can be best described as taking a generic Shonen Anime Protagonist archetype and giving him an extremely realistic relationship with his kid brother (who is also a dragon). Ultimately, this show fails because it follows a very obvious formula. Gao and Bal (or whomever the episode is focused on, if they wind up branching out) have some kind of fight, learn their lesson before the match starts, have some kind of solidification of what they learned mid-match, and then decide things by throwing cards at the opponent until they die. While this happens the commentator will insist that he won't be surprised, then immediately be surprised by whatever happens next, complete with over-the-top reaction shot. Only one thing happens to break this cycle in three episodes, and it amounts to the anime flat-out ignoring the game's rules after pretending it was going to stick to them, just so that Gao wouldn't be accused of being invincible.